Why is the Sharpless epoxidation enantioselective? Part 1: a simple model. The mechanism of the Birch reduction. Sequel to benzene reduction. I noted briefly in discussing why Birch reduction of benzene gives 1,4-cyclohexadiene (diagram below) that the geometry of the end-stage pentadienyl anion was distorted in the presence of the sodium cation to favour this product. This distortion actually has some pedagogic value, and so I elaborate this here. The starting point is now the molecular orbitals of benzene, and in particular the lowest unoccupied set (LUMO), which is doubly degenerate (in energy). First of the pair of degenerate lowest unoccupied MOs of benzene. Click for 3D. 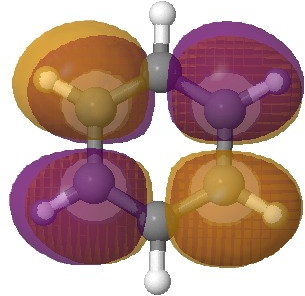 Second of the pair of degenerate lowest unoccupied MOs of benzene. Click for 3D. 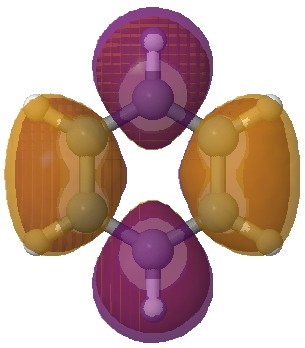 An (overall) two-electron reduction of benzene (followed by protonation) can formally at least place the two electrons into either of these orbitals. Doing so would lower the energy of the occupied orbital, and hence induce a geometric distortion as illustrated below. In effect, the outcome is an (antiaromatic) di-anion with either two short and four long bonds, or the alternative of four shorter and two long bonds. The proximate presence of a solvated sodium cation now clearly breaks this degeneracy; the coordination preference of Na+ (and a proton) favours the former over the latter, and the outcome is as shown in the previous post. The orbitals of benzene are frequently included in undergraduate teaching, but here we have a direct use for the LUMO pair in explaining the outcome of the reduction of benzene by electrons. It also links into what happens when anti-aromaticity is avoided (when a 4n π-electron system distorts to avoid it). 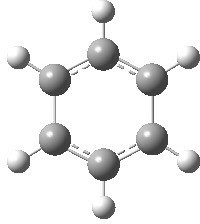 Postscript: The computed structure of benzene di-anion is shown below. It is 19.5 kcal/mol lower than the alternative valence bond isomer. Stable form. Click for 3D. Less stable form. Click for 3D. This entry was posted on Wednesday, December 5th, 2012 at 11:22 am and is filed under Uncategorized. You can follow any responses to this entry through the RSS 2.0 feed. You can leave a response, or trackback from your own site. The mechanism of the Birch reduction. Sequel to benzene reduction. is licensed by Henry Rzepa under a Creative Commons Attribution-Noncommercial-Share Alike 3.0 United States License.